Throughout this page we refer to Electric Vehicles as EV's. What sort of Electricity does an Electric Car use? Were often asked this ...its 'normal' electricity that you have in your house. Where can I fill up an electric car? From your house with a 3 pin plug, or an street charger yes it really is that simple. How can I get a home charger? 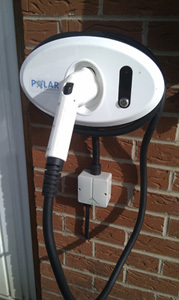 Yes as of today you can ask for a 16 and 32 amp wall mounted home charge unit, contact me for details. Be quick as the Government has limited funding as of Jan 2019 (circa £500 in England with an extra £300 if you live in scotland) and it will run out! You do have to own an EV to now qualify for a charger. How fast does an Electric Vehicle charge? This can be confusing at first, I will keep it simple. 2. Type 2 . This is a cable that fits into chargers at city car parks and street chargers and charges at 16 amps. Some EV's are equiped to take 32 amps and again most street chargers can recognize these EV's and allow 32 amps into the vehicle. This gives 18-20 miles of range added to the battery in 1 hour at 16 amps , or around 30 miles per hour at 32 amps. This is also the same 16/32 amps charge rate as a wall mounted home charge unit. Buy your cable here. 3. Rapid charge This is available at Nissan dealers and Ikea stores and Welcome Break service stations, and at around 110amps can completely charge your car (to 80%) in around 25 minutes. How far can I drive My Electric Car? On average around 80-90 miles (Nissan /Renault and others say 110 miles plus, but in everyday use 80-90 is more realistic) Your driving style will also affect the range ,driving an EV does make you a more relaxed driver, and its great seeing how you can increase your range whilst you drive too. On an overnight cheap tariff around £1.80 ! We do not notice it on our electricity bill at all, and if you have PV (solar panels)on your roof ,the cost is even less ! We get an income of around £1000 a year from our PV (with the 42p a unit Feed In Tariff payments as of 2011) to 'fuel' a Nissan Leaf for 12,000 miles costs around £400 in electricity, so our fuel is on our roof , with £600 in change ! How much does a public charge cost? Most now ask for a small fee per KWh of eletricity. Ecotricity have rapids in all Motorway service stations and if your an ecotricity customer at home then they offer 15p per kwh for a rapid charge. If your not a customer then they charge 30p per kwh of electric. You may require a swipe card or smart phone 'App' to access the public chargers, most of which are free (Ecotricity's card is free) some have a small yearly subscription (Chargeyourcar.org.uk and chargeplacescotland.org is £20 a year subscription ). Will I need to pay the Congestion Charge in London for my electric car or van? No,electric vehicles are 100% Congestion Charge exempt, but you do need to register at £20 a year with TFL ,I will happily fill in all the forms for you. 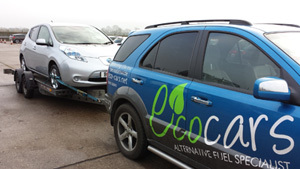 I live over 100 miles away, how can I get to you at Eco Cars? If you've watched the video tour of the car you'd like , and spoken to me, them I'm happy to transport your EV to your door for a small fee, Simple! Service costs for an Electric Vehicle? Very, very low, as there's no oil,clutches,pistons,spark plugs, belts etc. Most EVs require a yearly check on the brakes, tyres, lights and a pollen filter change (this keeps the inside of the car smelling nice!) All it costs is around £100 for a yearly check over. Life of the batteries in an Electric Car? To date I've yet to read of any modern EV's requiring new batteries , most vehicles have a modulare set up. The Nissan Leaf consists of 48 modules and each module contains four cells, a total of 192 cells. If the range starts to drop, all that is required is to replace the module or cell that's causing the problem. It's a myth that the whole battery will need replacing. Costs of battery replacement in an electric vehicle? As battery technology improves, costs are reducing. In years to come it may be possible to retrofit a set of batteries to increase the range and performance of the vehicle. You can read of an Taxi company in Cornwall C & C Taxis and their 174,000 mile Nissan Leaf which they've covered in 4 years (Nissan leaf with over 100,000 miles) There has been a 10% loss in range. 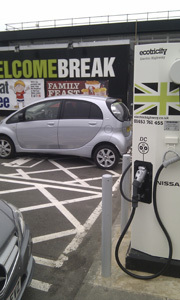 There are also UK Nissan Leaf owners with over 100,000 miles covered and the cars are still running fine. You still have lots of questions? That is understandable ! Owning an EV is not like owning an ICE (internal combustion engine) car. I've just covered the basics here , so call me anytime if you have more questions.